Super Omega 3-6-9 with a high content of essential fatty acids of vegetable and animal origin. Fish oil, linseed oil and borage oil. With Omega -3-6-9. 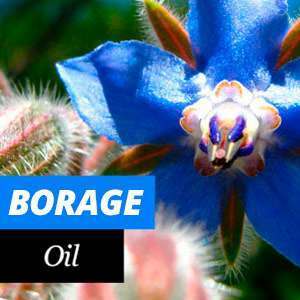 Borage oil comes from the borage plant seed (Borago Officinalis) and belongs to the boraginaceae family. It is a medicinal and aromatic plant that can reach up to 70 centimetres in height and is native to the Mediterranean regions. It is also currently cultivated as an ornamental plant, from May to September, in many of the European and North American countries. Initially its flowers are pink and are later transformed into a brilliant blue hue when mature. Borage oil contains high-quality ingredients, especially gamma-linolenic acid, (GLA), at around twenty per cent. GLA is one of the vital essential fatty acids, which cannot be generated by the body. Which foods contain the most omega 6 (like borage oil)? What symptoms are caused by a gamma linolenic acid (contained in borage oil) deficiency? High quality Borage Oil is produced through a cold pressing process of the borage plant seeds. Borage oil dietary supplement has has high plant acids content. Borage oil contains a large quantity of Omega 6 in its chemical composition, which is essential for the organism. Gamma linolenic acid (GLA) which contains borage oil, is a precursor of various substances called prostaglandins, that are similar to hormones. Prostaglandins are generated "in situ" when they are needed and then disintegrate again. Up to thirty different types of prostaglandins involved in various functions in the organism are currently known. Its properties include: regulating the cardiovascular and immune system, the coagulation of blood, reducing cholesterol, improving skin and joints, alleviating the symptoms of the menstruation cycle, renal function, and the function of the gastrointestinal tract. In addition, it is one of the best natural remedies for maintaining healthy skin and improving its protective function as a barrier against external aggressions. Polyunsaturated acids cannot be produced by the body, so one must consume them in food in order to prevent a deficiency in the body. Gamma linolenic acid is an ingredient of borage oil that is rarely found in foods. It can be found, in animal products such as fish, meat and eggs, although only in small amounts. It is also found in vegetables, barley, oats, nuts and in some seeds. When the body does not regularly receive unsaturated fatty acids in the required quantities the effects are premature ageing and the deterioration and drying of the skin. When buying borage oil dietary supplements, the recommended dosage instructions should be followed. In the case of those taking medications, or of pregnant or breast-feeding women, it is advisable to consult with your doctor first. Taking borage oil supplements is very beneficial for people with eczema. Taking an increased quantity of gamma linolenic acid reduces itching and regulates the moisture content of the skin. Therefore it also prevents the appearance of more eczema on the skin. Various studies have come to the conclusion that taking borage oil supplements for several weeks can relieve the symptoms of rheumatoid arthritis. When the skin does not have a sufficient quantity of gamma linolenic acid, it is no longer capable of retaining the moisture it needs and becomes drier. This can lead to sensitive, irritated skin, wrinkles, and itching. A dietary supplementation of borage oil has, among other properties, the ability to improve skin elasticity and flexibility. Borage oil also stimulates the formation of new cells. Borage oil is a natural remedy with many beneficial properties for the body. You can buy this dietary supplement with full confidence, since it has no observed side effects or contraindications.